From 1999 to 2000 a lady friend of ours – Anne-Irene Larsen – visited Prashanthi Nilayam. She was close to several ‘insiders’ at Prashanthi Nilayam, especially Mr. & Mrs. Ratan Lal and the US lady called Veronica, who ran the foreigners’ canteen and who was known for reporting to the Sai officials young men who claimed they had been sexually molested, who were blacklisted and thrown out immediately without notice with police intervention. As also was Dr. Naresh Bhatia, among many others through the years. Mr. Ratan Lal – now deceased - was one of Baba's long-term close followers, a resident at PN who held lectures there (incidentally, on an self-defeating inconsistent amalgam of Sathya Sai Baba and Ramana Maharshi's teachings, which can be seen for what it is in his published books of the same, edited heavily to make them better by none other than Anne Irene Larsen, now very much an ex-devotee of Sai Baba). Ratan Lal was short of stature and sometimes had a typical bossy manner on those who, like him, had donned the role of some kind of spiritual lecturer after retiring as a businessman. My friend Anne-Irene Larsen also helped me with investigation about Sathya Sai Baba’s alleged sexual abuses when she stayed for a long period at Prashanthi Nilayam and other ashrams. These included the Ramana Maharshi ashram at Tiruvannamalai, where a Hungarian ex-Sai devotee lady was staying, having been at Prashanthi for four years. This lady told Anne-Irene that she had talked with several sexually abused students there and that this had been the last straw in her decision to leaves Sai Baba. Mr. Ratan Lal confirmed to Anne-Irene when asked that a formerly very prominent Greek devotee family there had immediately withdrawn their son (called Socrates) from the college when they learned he had been sexually abused by Sai Baba. However, Ratan Lal explained this away by saying the Greek father had too big an ego, so could not stand the proximity to the Lord! See notes recording facts about Mrs. Ratan Lal This kind of slur against others is typical of devotees in deep denial, of course, and they have a model in Sai Baba himself, whose 2000 Christmas Discourse set the abusive and mendacious tone. When will Sathya Sai Baba die? The prophesy Sai Baba allegedly made about himself ‘leaving his body’ at the age of 96 was not documented until he stated this finally in a discourse after 2003. Not, that is, unless one trusts the account of Mr. V. Balu of Bangalore, whose book ‘The Glory of Puttaparthi’ made the claim that Sai Baba had foretold this in the 1980s. 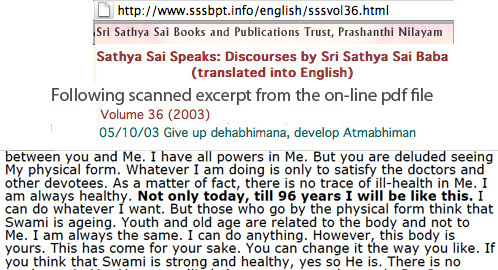 However, according to Sai Baba’s previous published statements (see inset scan) he would leave the body at the age of 93 or 94 maximum. Since then Ratan Lal told Anne Irene that Sai Baba had repeated the prediction of 96 years personally to Ratan Lal. Moreover, Sai Baba had also told him that was nobody's business when he would leave the body - he could even prolong his life if he deemed necessary! It certainly seems he was covering himself for whenever it actually happens! There have been mistaken reports about this incident, including one referring to the wife of Colonel Joga Rao - but he had no wife and was a known misogynist (and barrack room style whiskey tippler and dirty story teller too). Mrs. Ratan Lala related her account in 1998to our former Sai-follower Norwegian friend Anne-Irene, as Mrs. Lal did to many others. After the photo was taken, Sai Baba explained to Mrs. Ratan Lal that he had just then manifested within himself the power of Dattatreya, deadly to the touch of mere mortals! "Bhagavan looked pointedly at me and in a stern voice asked me, "Who are you?" I hesitated to give an answer. With hands folded, I looked humbly at Him. Then, Bhagavan started talking to some other people for about ten minutes or so, and again in the same manner asked me, "Who are you?" as if I had intruded into the gathering. Again, I remained silent with folded hands. Again, Bhagavan talked to the other people for fifteen or twenty minutes and then for the third time looked at me piercingly and asked, "Who are you?" Upon hearing this, Sri Kasturi took pity on me and tried to intervene by telling something to Bhagavan. Bhagavan immediately asked him not to intervene. The third time also my reaction was the same. I stood in silence with folded hands. I took it as an informal method, not ritualistic, of His initiating me on the path of self-inquiry. After about twenty years, once, when I was with Bhagavan in His car, He said, "The core of your being is consciousness, but do not meditate or contemplate on the consciousness aspect (sat), but on your eternal being (chit). If you concentrate upon consciousness, the mind jumps and bumps." This is a simple trick practiced by many swamis and gurus in India to dominate persons and make them dependents and servitors - making them think they do not know who they are. Thus they get launched on what can be described as a tortuous self-programming with an abstract and empty 'identity' and and ultimately pointless search for an identity as something they have either lost or imagine to be something other than what they are. Many end up longing for the final realization through death (and liberation thereafter). The mental contortions, mind-numbing meditation and repetition of mantras etc. which, only if pursued relentlessly as one is supposed to do, lead to social isolation, solipsism, narcissism and often also what is - to all intents and purposes - mental derangement and madness. The various devotees of Sathya Sai Baba who have written or lectured at the ashrams about there being no free will include Dr. Bhatia, Ratan Lala, Jack Hawley, Robert and Rita Bruce and a number of other 'amateur theologians'. Confused and untrained minds passively accept the 'great delusion of the East', that no one has a jot of 'free will'. They are evidently always at sea as to all the meanings of the words 'free will' and in which sense they are used at any time, though they hold it an an absolute divine truth that free will is impossible. They seem to grant free will only to God as Creator, Sustainer and Destroyer. This conflicts totally with the doctrine which also holds that everyone is a part of God, is essentially God. Thus taking leave of their senses (which Sai Baba propounds as the way to self-realization), they take as gospel a metaphysical system which has little or no basis in experience or reality… despite all the claims by those who are deluded by it into distorting experience. 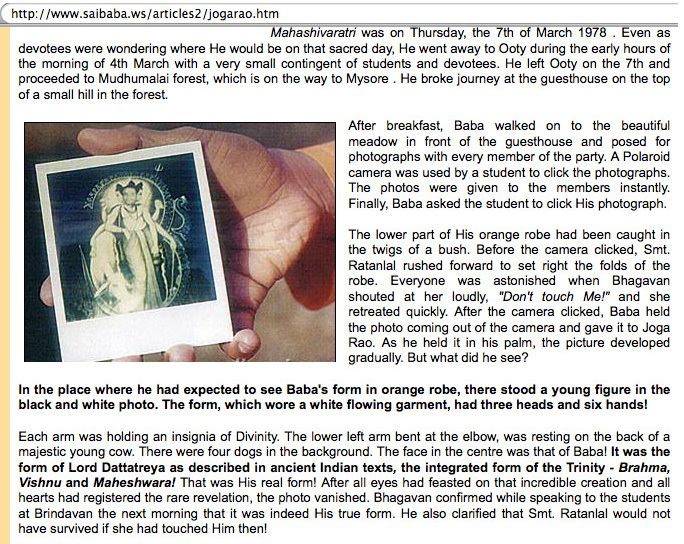 Ratan Lal is credited with taking the much publicized picture from decades ago of Sathya Sai Baba holding a golden statue of Krishna (allegedly 'materialised' by him beneath the sand... more likely placed there in advance by his close servitors like Joga Rao who did not believe in his miracles at all, despite being present to many such 'sand' materializations. 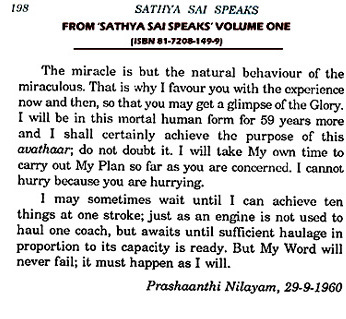 It can be seen here or at http://www.sathyasai.org/images/withkrishna.gif (if not removed).